In a July 2016 judgement, SC ended the immunity provided by the Armed Forces (Special Powers) Act of 1958 (AFSPA). A Special Bench monitoring the CBI investigation into the alleged extrajudicial killings in Manipur will hear a petition filed by 355 Army officers in the Supreme Court, alleging “persecution” by agencies such as the CBI for doing their duty in the insurgency-hit areas of Jammu and Kashmir and the north-eastern States. 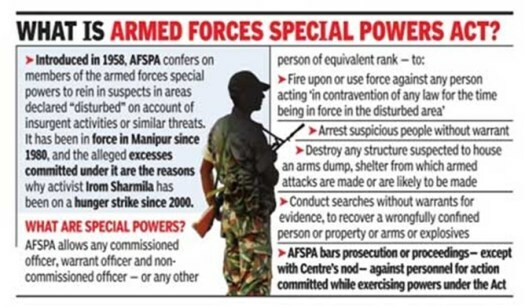 In a July 2016 judgement, the Bench of Justices Lokur and Lalit ended the immunity provided by the Armed Forces (Special Powers) Act of 1958 (AFSPA). The judgment declared that “there is no concept of absolute immunity from trial by a criminal court”. Post the judgement, an “extraordinary circumstance” is prevailing over armed forces personnel fighting in the insurgency-hit areas and the nation’s borders. They are plagued by doubts whether performing their duty to fight enemies would expose them to prosecution and land them in jail. The petition said the Supreme Court’s orders and the resultant CBI action against Army personnel have made soldiers jittery. The on-going situation is demoralising the officers and troops deployed in field areas and fighting in counter-terrorism and counter-insurgency operations in Jammu and Kashmir and north-eastern States. The Indian Army has to, in given circumstances, take quick decisions which cannot be dissected later on like an ordinary murder appeal. The scope of judicial review against active military operations cannot be on the same parameters as in other situations. Reports of blatant misuse, or rather abuse, of the law by the armed forces have flowed through the years, especially in the Northeast and Kashmir. Impunity is to address any allegation of use of excessive or retaliatory force beyond the call of duty. It is the requirement of a democracy and the requirement of preservation of the rule of law and the preservation of individual liberties that it does not matter whether the victim was a common person or a militant or a terrorist, nor does it matter whether the aggressor was a common person or the state. The law is the same for both and is equally applicable to both. Given this history of violence and bloodshed trailing AFSPA, the judiciary’s attempt to make it less draconian and more accountable is a step in the right direction. Judicial review tears down the cloak of secrecy about unaccounted deaths involving security forces in disturbed areas and serves as a judicial precedent to uphold civilian and human rights in sensitive areas under military control.